Your app isn't limited to the custom fonts provided by iOS. If your company has its own branded font, for example, you can use it in your app. Add the font file that contains your font to your app bundle, then use your font the same way you use any of the iOS-provided custom fonts. 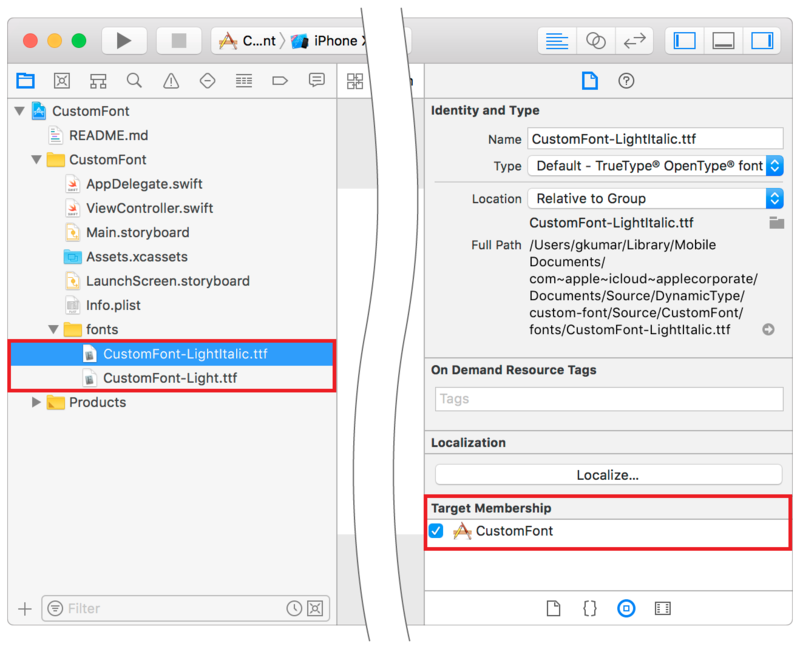 To add a font file to your Xcode project, select File > Add Files to “Your Project Name” from the menu bar, or drag the file from Finder and drop it into your Xcode project. You can add True Type Font (.ttf) and Open Type Font (.otf) files. Also, make sure the font file is a target member of your app; otherwise, the font file will not be distributed as part of your app. After adding the font file to your project, you need to let iOS know about the font. To do this, add the key "Fonts provided by application" to Info.plist (the raw key name is UIAppFonts). 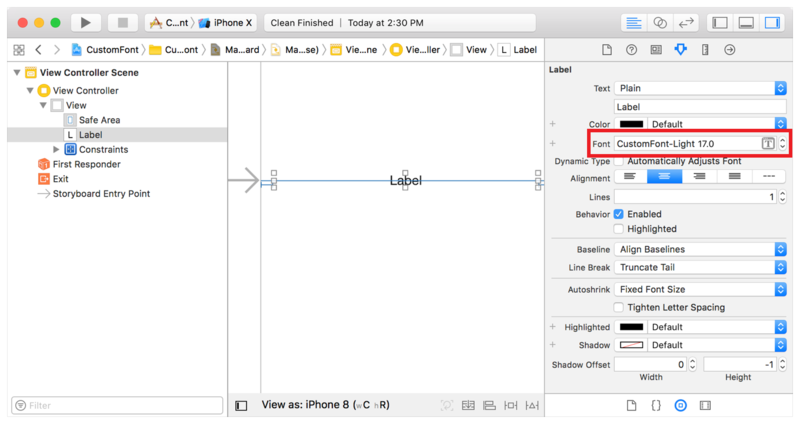 Xcode creates an array value for the key; add the name of the font file as an item of the array. Be sure to include the file extension as part of the name. Each font file you add to your project must be listed in this array; otherwise, the font will not be available to your app. 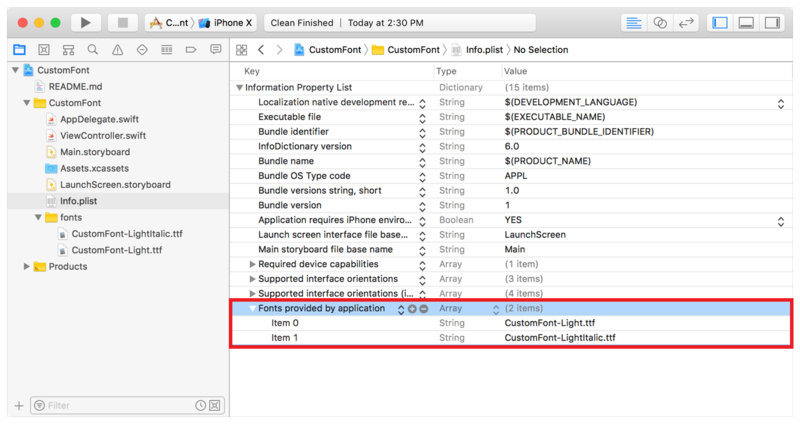 After you add the font file to your Xcode project and its Info.plist, you can begin assigning the font to UI objects like UILabel and UITextField. If you’re using Interface Builder, assign the UI object’s Font setting to your custom font using the Attribute Inspector. Failed to load the "CustomFont-Light" font. Make sure the font file is included in the project and the font name is spelled correctly. For more information on using scaled fonts, see Scaling Fonts Automatically.